We createded this dictionary to make it easy to understand the definitions of the various arcane terms used in CNC. For more in-depth articles, click the Cookbooks menu at the top of any page. There's still more information on every imaginable CNC-related subject in the CNCCookbook Blog. 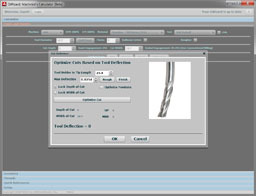 Tool Probe: See "Touch Probe"
TPI: See "Turns Per Inch"
VMC: See "Vertical Machining Center"
VTC: See "Vertical Turning Center"
TBD = Topic placeholder. A definition still needs to be written. = Dipicts a newly added topic, for those who are reading the dictionary and want to know what's changed. I will likely be pretty random in how I update these, so you may miss a new topic if I happen to flip the new flag off a bit early. I'm thinking of doing something real simple, like flipping them off at the beginning of a month or some such.